If you've ever been to an optometrist or optician practice and tried on some frames, you'll have noticed that you may have picked up frames thinking they would look good on you, and then put them on your face and thought – naaah! Doesn't work! And yet, along comes the optical dispenser and he or she picks a frame (seemingly randomly) and it looks a lot better on your face than the one you chose? So, what is it that they know that you don't? Well, when it comes to choosing the best type of frame for you, certain frame shapes work better with certain face shapes. So, the first step is to determine what shape your face is. Then, use this guide to work out which shapes will suit you best. This page needs to have illustrations all the way down the RHS – showing the shapes of the faces. These can be photos, or they can be 'cartoon' images. Round shaped chin, with face width and height the same – and rounded cheeks. Choose rectangular/square shaped frames – they help to elongate the appearance of the face. A frame where the arms and temples connect at the top of the frame (as in many Supras/semi-rimless frames) also helps add height to the face. Oversized frames – they only make the face seem bigger. Face width and height similar. Angled jawline and square chin. Choose round or oval frames – they soften the angles of the face. Don't go for square angulated shapes. Face with a wide forehead and cheeks, narrowing below to a more pointed chin. A narrowish round shaped frame helps to narrow the appearance of the forehead. Frames that are wider or more pronounced at the bottom of the frame, help to draw the eye down the face and give balance. Lower set temples also help to add width to the face. Frames that are top heavy and so attract attention to the broad upper face – eg, frames with large temples at the top of the frame. Face widest at the cheekbones, and narrow forehead and narrow chin. Rimless frames – help accentuate and show off the cheek bones. Oval frames can help balance the facial features. Don't choose narrow frames, as they make the eye line seem even smaller. 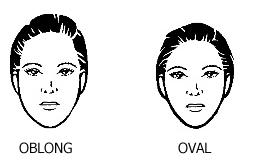 Face narrower at the forehead and eyes, wider at the smile, jaw and chin. Top heavy frames, such as semi-rimless/ supras, that help to draw the eye to the top of the face, and widen the eyeline. Frame shapes that are narrower below than above – balancing the triangular face which is the opposite – narrow above and wider below. Long and thin face – height much greater than width. Tall forhead, long chin. Wide frames, with big temples help to add width to the face. Frames with height help to balance the long face. Narrow frames that make face look thinner, and short frames that make the face look longer. Geometric shapes help to add angles to the soft oval curves of face. Oval faces are lucky – most frame shapes seem to work well.